If you're on Facebook, you might like to 'like' our Matthias Media page. Not only is this a good way to keep in touch with our news, but it's really helpful to us when your friends see that you've become a fan or interacted with us in some other way. Hopefully some of them will check us out too. But Facebook doesn't necessarily pass on all of our news. So please see our Tips for keeping in touch via Facebook page for more information. We also have a page for The Briefing and The Trellis and the Vine. For those who like their updates in even smaller bits, Matthias Media also Tweets. As does The Briefing. You can also receive content from The Briefing via RSS feed. You want to grow in Christ and share him with your family, friends, colleagues and church—so do we. That's why we publish practical ideas on how to live as a disciplemaker. 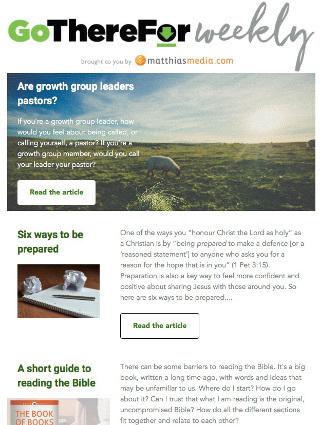 Every week we send out an email with links to new articles and other helpful information for Christians who want to seek God's kingdom first.